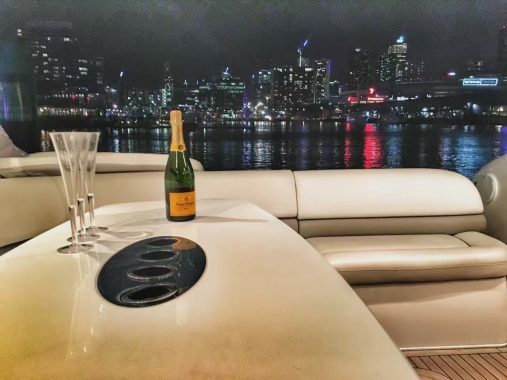 And while many luxury cruisers rely on their levels of comfort and fittings to win over buyers, every now and then a luxury motoryacht comes along that’s a bit different. The Sunseeker 47 is one such boat, she still has all the levels of luxury and standard of fittings as the other contenders, but she can also boast sportboat-like performance. Fitted with twin 550 hp Cummins diesels, she was still capable of topping 36 knots fuelled and ready to roll. Engine standard fitment is two 550 hp Cummins. 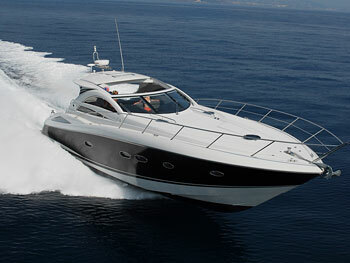 And considering her performance with twin 550 hp engines, twin 1100 would be awesome. But it wasn’t only the boat’s top end speed, which was good for a boat of this size, it was her silky smooth, quiet and precise handling that would be indelibly planted in the minds of the Modern Boating Team. The handling was so precise it was literally a case of turn the helm a couple of centimetres and you could immediately see the bow move a couple of centimetres in that direction. Smooth is not a strong enough adjective to describe the feel of the steering, which was of course complimented by precise electronic engine controls, the steering was exceptional. There I was behind the wheel of almost 50 feet of luxury cruiser and it handled like a ski boat. Even the V47 s turning circle leaves other 47 footers (pardon the pun) in her wake. The boat leans into turns like a 20-foot monohull, while having props in the mini tunnels formed between the large chines and the keel, eliminates tail slippage and help her props bite the water hard. Push the throttle firmly forward and the electronic engine controls bring the hull onto the plane quickly and if not pulled back will continue to accelerate up to 36 knots at 2200rpm. Obviously, this would not be conducive with economical fuel economy, but pulling her back to 15 knots at 1350rpm almost halves the amount of fuel being burned. An ideal cruise speed for the V47 was 18 knots at 1800rpm. This boat also has an extremely sharp bow entry, so the hull slices through the water cleanly, while the tunnels formed between the second strakes and down-turned chines also aid lateral stability and straight-line tracking. She’s an extremely seaworthy and dry boat. But it isn’t only her performance and handling that make this boat a real winner. Like all sportscruisers, her rear cockpit is designed for entertaining and outdoor living and in the case of the V58, this cockpit is enormous, but more on that later, because her design also allows for plenty of living room below decks. Walk down the stairs into the main saloon and you’ll find it’s bright, four large portholes let plenty of natural light into the cabin, and open plan. Comfortably sleeps four with two berths and two bathrooms. The hydraulic swim platform is a dream to swim or jet ski off!